U.S. Secretary of Commerce Gary Locke and Mongolia’s President Tsakhiagiin Elbegdorj today announced agreements to expand cooperation on trade and economic issues, and support Mongolia’s aviation sector with technical assistance and training programs at a Blair House ceremony. The Boeing Company also finalized a purchase agreement with MIAT Mongolian Airlines for one 767-300ER and two 737-800 aircraft valued at $245 million from The Boeing Company. This is the first direct purchase of Boeing aircraft by MIAT, and marks the first time in more than two decades that MIAT will extend its route network by purchasing Boeing airplanes instead of leasing them. 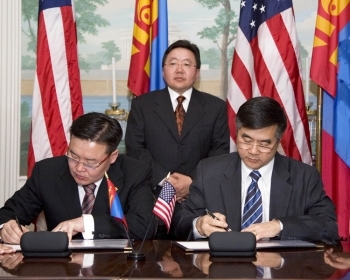 Locke and representatives from the United States Trade and Development Agency (USTDA) and the U.S. Department of Transportation’s Federal Aviation Administration (FAA) each signed agreements with Mongolian government and private sector officials promoting cooperation between the two nations. Locke and Mongolia’s Minister of Foreign Affairs and Trade Gombojav Zandanshatar signed a Memorandum of Understanding on Trade and Economic Cooperation. Commerce and MFAT agreed that strengthening cooperation, exchanges, and technical assistance; sharing experiences in implementing a strong commercial legal regime; and promoting trade and investment are key to further development of the bilateral trade and economic relationship. U.S. exports to Mongolia increased by 184 percent in 2010, totaling $115 million. USTDA and MIAT Mongolian Airlines also signed an MOU that provides funding for an Airline Executive Management Training program, which will help MIAT expand its business and be more successful by adopting better business management, strategic planning and professional development measures.